Your home should be a retreat from your busy life, so we strive to help you eliminate chaos, reduce the stress that comes with it, and enhance your efficiency. By listening to your concerns and priorities, we create a personal plan that works for you and can be sustained over time. We will never pass judgment and no mess is insurmountable! It just takes a plan, time, patience, and a sense of humor. We will provide a comprehensive, personalized plan of action to address your particular priorities and areas of concern. You choose one of the following options to make it all happen. “I don’t have time for this”— Home Street Design will work our magic (hourly fee) With this option, clients will need to make themselves available for consultation on the more personal choices involved with creating an organized space. Regardless of your choice to go it alone, or with us, your action plan will include strategies to eliminate obstacles, recommendations for products and maintenance, and steps to sort, purge, and contain the chaos. 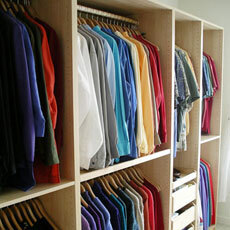 To see examples of professional organization, visit our gallery.